Methanol Toxicity - Treatment, Symptoms, Prevention, What is? Methanol is a type of alcohol that is not meant for consumption. Ingestion of a toxic amount of methanol can lead to a number of toxicity symptoms and can even be fatal. This event is known to occur in the developing world especially to the employees in lower socioeconomic classes [1, 2, 3]. The chemical methanol is a colorless watery liquid that is frequently used as an industrial chemical . The chemical itself is not toxic but once the body metabolizes it, it turns into formic acid which is a known neurotoxin. Methanol can be found in de-icing fluids, pesticides, paint removers, copy machine fluids, antifreeze, solvent and poorly processed alcoholic beverage [1, 2, 3]. Most cases of methanol toxicity occur after ingestion of fluids that either contains methanol or contaminated with the chemical. Methanol can also be absorbed by the body through the inhalation of methanol vapor or absorption through the skin. The initial manifestations of methanol toxicity appear about 12-24 hours after the ingestion. Initially, there may be difficulty or absence of breathing, blurring of vision, hypotension or decreased blood pressure, agitation, dizziness, difficulty in walking, diarrhea, severe abdominal pain and seizures [1, 2]. If the patient does not receive any medical attention, the condition will progress to metabolic acidosis. The acidosis will manifest as tachycardia or increased heart rate, tachypnea or increased respiration, hypertension or increased blood pressure and alteration in the patient’s mental status. Pulmonary edema, acute respiratory distress or heart failure may also occur if the patient has ingested or exposed to a large amount of methanol . 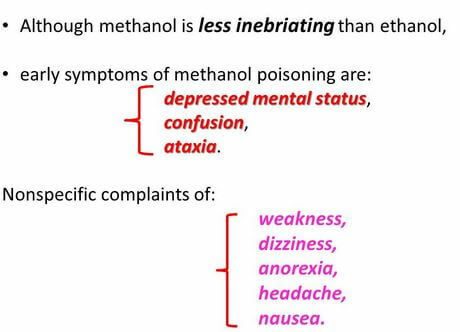 A patient who is suspected to suffer from methanol toxicity should be brought to the hospital as soon as possible. Information such as the type of methanol the patient was exposed to, the amount and the time the exposure occurred will be helpful in the management of the toxicity . Once the patient arrives at the hospital, the priority is to establish the airway and breathing. Intubation may be required if there is acute pulmonary distress or pulmonary edema. An intravenous access will also be established to administer fluid and medications. If the ingestion occurred less than 60 minutes prior, a tube may be inserted through the patient’s nose to remove any remaining poison in the stomach. Once the patient is stable, antidotes may be given to the patient. The antidotes used for methanol toxicity are ethanol or fomepizole. These substances delay the metabolism of methanol until it is removed from the body either naturally or through the help of hemodialysis. 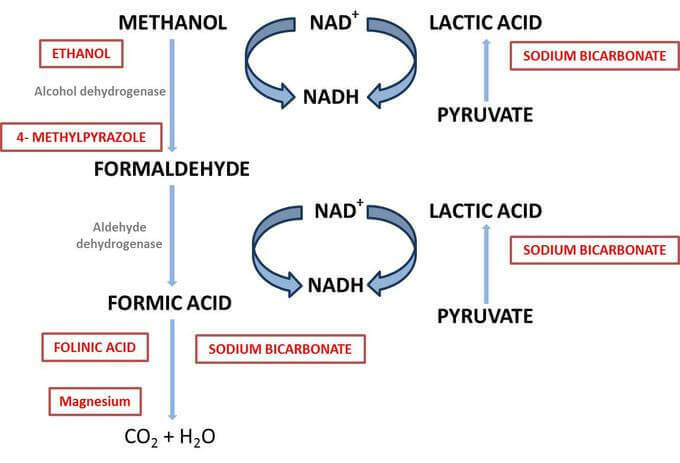 Delayed metabolism of methanol will lead to lesser toxicity symptoms. The vital signs and blood methanol level of the patient will be monitored throughout the therapy. The patient may be discharged once they are symptom-free and the amount of methanol returned to normal levels [1, 2]. Accidental ingestion of methanol can be prevented by properly labeling the chemicals that contain this substance and keeping them in places that are out of children’s reach. Employees who are utilizing methanol should wear the appropriate personal protective equipment while handling the chemicals to prevent any unwanted exposure to methanol [1, 2, 3, 4]. Methanol toxicity can be dangerous and it should be prevented at all times. If you have more information about methanol toxicity, feel free to share your thoughts in the comment section below. Kruse, J. A. (1992). Methanol Poisoning. Intensive Care Medicine, 391-397.